Tradition meets modern design in the Flyscreen. Its clean, minimalist appearance is accented with your choice of chrome or black front trim plate. This little screen looks great on drag bikes, performance machines and custom creations. Installation is easy. 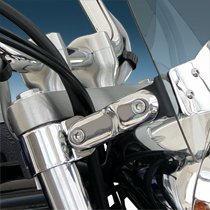 Available in fork-mount or headlight-mount styles. Flyscreen headlight mount models also fit many older airhead BMWs from 1955 onwards. 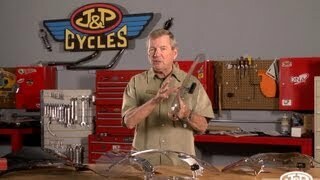 The Flyscreen® is a small windshield that will really enhance the front end of your classic or retro-style. The clean appearance is accented with a chrome or black front trim plate. Our Linking Arm Mounting Hardware with countersunk screws offers a truly custom fit for any bike with exposed fork tubes. 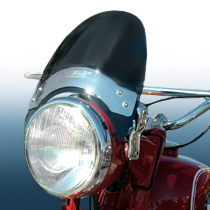 Also available is our Headlight Mount System that is the perfect setup for many standard bikes and older models with traditional headlight mounting. The Flyscreen has a lot of quality features and great design in a very small package. The Flyscreen® is made from durable High Impact Acrylic material for outstanding value. Available in Light Tint that allows the bike's details to show through. For that dark custom look, get the Flyscreen in Dark Tint. The tint is dark enough to hide cables while letting just a little bit of shine come through. The Dark Tint Flyscreen is made from FMR hardcoated polycarbonate and is covered by our 3-Year Warranty against breakage. 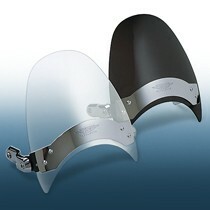 The Flyscreen® in 25% Light Tint is made from 3.0mm High Impact Acrylic. The Flyscreen in 95% Dark Tint is made from 3.0mm FMR hardcoated polycarbonate and is covered by our 3-Year Warranty against breakage. Both are DOT and ABE Approved. 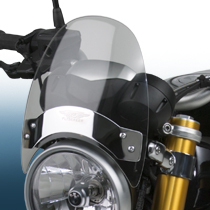 The Flyscreen has a chromed or black painted steel front plate with machined steel Linking Arm™ Mounting System. All mounting hardware is included.